Express lanes as the name indicates are the fastest roads one can take to work during peak hours. The traffic flow is not only fast, but smooth too and the route leads to I-495 Beltway and I-395 lanes. Hot lanes are like the traffic hotline for when you need to save your time, a hot lane on an average day can save a commuter some 30 to 45 minutes. But the use of this road is subjected to a toll, which has caused it's popularity to be divided into two popular thought schools. Many believe that a few dollars are worth nothing in exchange for their valuable time whilst others argue the government is responsible for the provision of such roads for free, after all these were made out of taxes. The I-95 express lanes comprises of a 29 miles runs between Edsall on the north and 610 on south. Most commuters that hit the road on a daily basis have a routine to follow, some everyday location to make to, in time. The fastest route you can take, almost no traffic jams and fast driving with almost no brake slamming make it a tempting option for many. Launched on December 16, 2014 this project makes use of a distinct dynamic tolling, you pay tolls based on what kind of traffic you had to drive through as you accelerated your ride down the highway. And laden with dynamic sign boards such as speed limits make this an exciting ride, much like weather conditions and human responses this highway is responsive to traffic conditions. Looking at the level of ease that the road has been able to provide the masses with has the authorities considering another extension in the project that connect to Washington, DC. Lane closures are yet another reason to love this dynamic road, from changing speed limits to a constantly updated closure schedule online if a road could get any smarter it would take over the city. Lanes have been dedicated to commuters, for instance heavy traffic and commercial transport have their respective lanes making not only the commuting faster but smoother and hassle free. High speed mobility in a metropolis is a challenge, getting anywhere in time with unexpected traffic conditions is no longer the kind of stress that should bring you down before that important flight, meeting or appointments. Getting anywhere, everywhere around the city faster is the one thing that I-95 came with, unless you have a great deal of time to waste you should feel in no way but positively towards this marvel if modern day engineering and civil planning. One project done well. A new commuter bus system will mean less congestion and reduced travel times, but can construction be completed in time for the program’s launch? Great news for commuters headed to Mark Center who are tired of the grinding drive. Starting December 7, 2015, there will be an alternative for commuters who are looking to skip the drive. 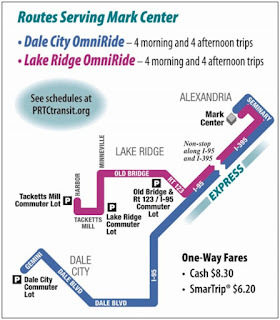 Two new OmniRide commuter bus routes will be opening that lead straight to the Alexandria facility. The bus routes will be completely funded by the VDRPT (Virginia Department of Rail and Public Transportation) in an effort to reduce congestion and gridlock along I-395. These two new routes are the first of their kind, and offer a significant advantage for Prince William County commuters looking to skip the drive for the morning and afternoon rushes—each route will offer four trips for the morning and evening. Commuting via bus offers the distinct advantage of being able to relax on your commute or get some work done, effectively negating the worst aspects of commuting alone in your personal vehicle. Commuter buses will travel via the I-95 Express Lane and take advantage of the new I-395 HOV ramp located at Seminary Road. With one route starting in Dale City, and another in Lake Ridge, these new commuter services will provide ease of use and value to numerous commuters. Riders with SmarTrip cards will pay $6.20 one way, or $8.30 cash. For those slugging from Mark Center, the designated taxi-drop off and line up point is along Mark Center Drive, around the corner from the transportation center. While all of this information is good news, there is one problem; we don’t know when the new ramp from the I-395 HOV lane to Seminary Road will be open. Virginia DOT has the ramp opening scheduled for early December 2015, but there hasn’t been a firm date released yet. The total construction project is slated to be completed in the spring of 2016, and there are concerns regarding the coordination of the new commuter bus service and the opening of the Seminary Road HOV ramp in time for bus service to begin. While hopeful commuters wait for the good news, it’s back to the daily grind. 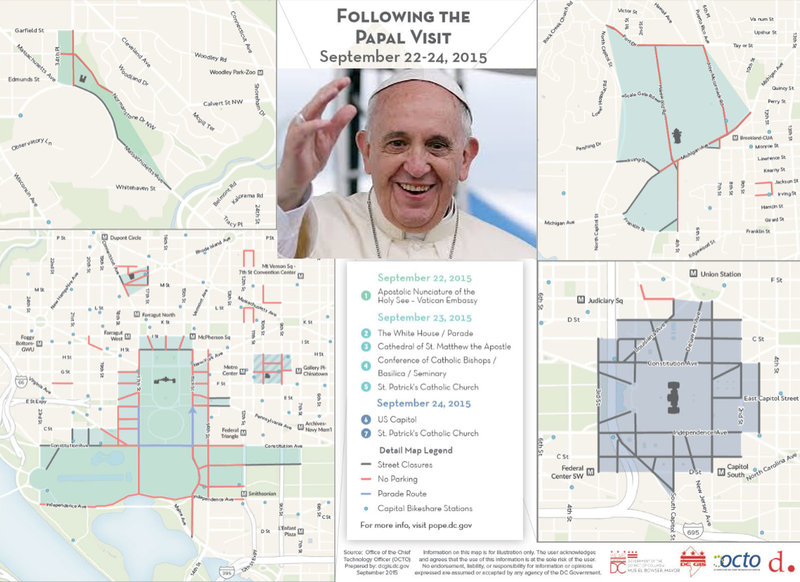 How did Pope alleviate traffic congestion in DC Metro? If you didn’t hear, the Pope Francis visited the United States recently, and of course a stop at the seat of American power, Washington DC was on his itinerary. His tour included a host of cities across the country, and in each and every one city officials were tasked with safely addressing the predicted massive increase in traffic volume. In the DC area particularly, there was increased scrutiny regarding congestion, traffic patterns, and travel times for commuters during peak hours. 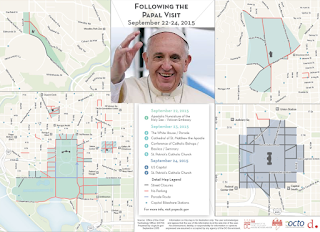 The entire summary can be found at http://www.mwcog.org/transportation/weeklyreport/2015/files/10-20/PapalVisit_FullMemo.pdf, if you like reading graphs and charts. The study was done with commercially available data gleaned from the GPS capabilities of smart phones and driver navigation units and spanned the week of the papal visit along with the week preceding. What the study found is that ‘modest reductions in driving during peak periods can yield dramatic improvements in travel conditions’. That’s not an exaggeration. In some cases, traffic volume reductions of only 4% yielded congestion reductions of as much as 36%. That’s a congestion reduction factor of 9x! That’s all well and good, but to put that in terms of driving time, inbound traffic on the I-395 between the Beltway and the Potomac took a mere 12 minutes for commuters as opposed to the normal rush hour travel time of 44 minutes. Not very many of us are in a rush to get to work, but shaving a half hour off the time spent sitting in traffic sounds pretty enticing. It wasn’t just peak hour traffic on I-395 that saw an improvement in congestion; Maryland’s I-270 saw a drop from 38 minutes to a whopping 11 minutes for commuters from the ICC to the Beltway. Remember, all of these improvements in congestion came from only a 4% drop in volume. What if that volume decrease could be achieved every day? What if the time savings of over thirty minutes could become the norm? The answer lies in minor changes to driving and work habits. In response to the anticipated traffic that the papal visit was predicted to produce, many employers instituted temporary telework policies and flexible hours for commuters. Together these practices created the effective decrease in traffic volume, and the related reductions in congestion. Carpooling, or slugging, can also regularly decrease volume during peak hours. Collaborating with coworkers can not only reduce fuel costs, but can also reduce commuter volume during peak hours. The next time you’re sitting in traffic with your empty car, remember that it only takes some small changes to make a big difference. A bold string of tire thefts have stranded and unsettled frequent commuters utilizing the Horner Rd. park-and-ride in Woodbridge, VA.
As if your daily commute wasn’t enough, imagine what would happen if you got back to your commuter lot only to find your car on cinder blocks, stripped of all four wheels. This has been the case for at least ten victims in the Horner Rd. park-and ride located in Woodbridge, VA, with a concentration of such incidents over the last five months. Stretching as far back as March of 2012, there is evidence of the coordinated theft of car rims and tires—thefts that leave commuter’s cars damaged and stranded on cinderblocks. With a recent flare up of criminal activity in May of this year, it has taken several victims with stripped cars to push law enforcement into taking action. Hopes that the March 2015 tire thefts were an isolated incident were dashed when in September four more vehicles were stripped of their tires. Not only were the rims and tires completely missing, but the vehicles also suffered undercarriage and frame damage as well. Shortly after thieves struck again, stripping another two cars in early October. The Horner Rd. commuter lot is maintained by VDOT and that organization is resistant to installing cameras to improve security. With no police force of its own, the commuter lot must rely on the local police presence for the security of commuters and their vehicles. Of course, without cameras the local police can only do so much, but in light of the rising number of victims the Prince William County police have taken action. Officers from both the Prince William County police department and Virginia State Police officers will be stepping up patrols through the affected commuter lot. More eyes mean more chances of catching the thieves in the act, but the real deterrent is the temporary installation of a mobile security camera maintained by law enforcement should prove the single greatest barrier to what is at face value a string of coordinated thefts carried out by a team of more than one criminal. One hopes that the publicity surrounding this series of thefts, due in part to the news reporting efforts of local NBC affiliate’s Julie Carey, coupled with the conspicuous security measures will make the tire thieves think twice before stranding another commuter. Understandably commuters are concerned, but the PWC Police Dept. has encouraged people that frequent the Horner Rd. lot—and surrounding commuter lots in the area—to immediately report any suspicious activity to the police.